The Bank of Canada surprised markets for a second time this year by cutting their target “overnight” rate of interest to 0.5% from 0.75%. 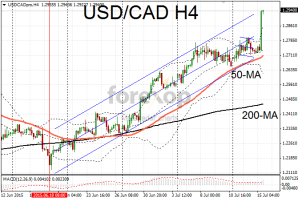 The Canadian dollar fell sharply on the news as did other high yield currencies including the New Zealand dollar and the Australian dollar. The Canadian “loonie” was off sharply against the US dollar extending the significant bullish rally in USD/CAD by another 1.6% or nearly 2 cents. Adding to the pain, the US dollar strengthened after Fed chair Janet Yellen gave her bi-annual testimony in front of the US Congress. The Bank of Canada downgraded its growth forecast from its previous meeting. Growth for the first quarter will be significantly below initial projects according to the statement. The Canadian economy is however expected to rebound modestly in the second half. The current projection puts GDP at around 1.1% for the year. The latest reduction in interest rates is intended to spur activity in the economy and allow the non-energy sectors to pick up the slack. 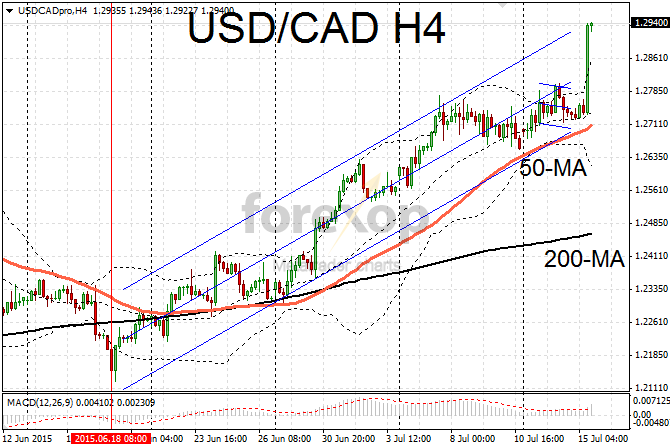 USD/CAD jumped to an intraday high of 1.2943. This took it to a seven year peak. Putting the gains into context – the greenback has advanced by 21% against the Canadian dollar in the past twelve months. The Australian dollar was also quick to react to the news. AUD/USD tumbled 1.2% as traders turned their attention to other regions impacted by falling demand for commodities and where further interest rates cuts could come. The bear rally in AUD/USD has pushed the rate down beneath the long term average which is currently around 0.78. Sentiment in the Aussie was already fragile after a disappointing consumer survey was published overnight. Westpac places consumer confidence at minus 3.2%. It is an improvement on last month’s figure of minus 6.9% but gave little for bulls to cheer about. Another major influence on the commodity sector is China. China’s latest growth estimates topped forecasts at 7%. Retail sales also improved in June on the previous month. Crude supplies fell by more than expected last week. Supplies up to July 10 fell by 4.3M barrels according to the EIA’s weekly publication. The data did little to support oil prices as events in China and Iran were more prominent. Brent crude fell $1.5 to $57.16.